Somewhere Jim Boeheim must be scratching his head. 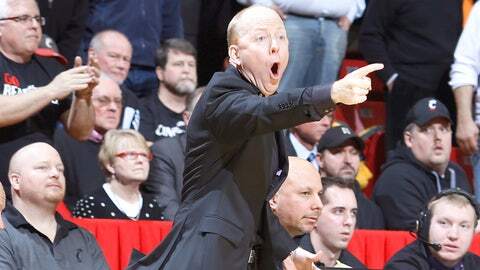 On Saturday, Cincinnati Bearcats head coach Mick Cronin blew a gasket in his team’s game against Connecticut after an out-of-bounds call did not go his way. He was restrained by his players, pushing them and coaches out of his way to try to argue with referee Ted Valentine. UConn ended up beating Cincy, 51-45. Now, Valentine is the same referee who ejected a fan sitting on the baseline of an Auburn game last week.